Chapter 1: What is active learning? 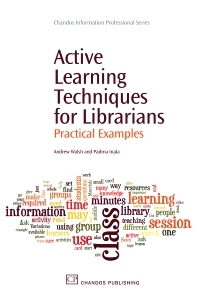 A practical work outlining the theory and practice of using active learning techniques in library settings. It explains the theory of active learning and argues for its importance in our teaching and is illustrated using a large number of examples of techniques that can be easily transferred and used in teaching library and information skills to a range of learners within all library sectors. These practical examples recognise that for most of us involved in teaching library and information skills the one off session is the norm, so we need techniques that allow us to quickly grab and hold our learners’ attention. The examples are equally useful to those new to teaching, who wish to bring active learning into their sessions for the first time, as to those more experienced who want to refresh their teaching with some new ideas and to carry on their development as librarian teachers. Andrew Walsh is a Chartered librarian at the University of Huddersfield. He chairs the information skills teaching group at the University of Huddersfield library and regularly gives talks at conferences across the UK, particularly in relation to information literacy and its teaching. Padma Inala is a Chartered librarian at Manchester Metropolitan University supporting the field of education. Her research interests include Information Literacy and the teaching of information skills.